I have now taken an autosomal DNA cousin-matching test at all three testing companies – 23andMe, AncestryDNA and Family Tree DNA. With this type of test you also get as bonus feature a report of your admixture percentages. I thought it would be a useful exercise to do a comparison of my admixture results from all three companies. - All four of my grandparents were born in England. One grandparent was born in Bristol, and my other three grandparents were born in London. - All eight of my great-grandparents were born in England. Four of my great-grandparents were born in London, two were born in Hampshire, one was born in Bristol and one was born in Gloucestershire. - I know the birthplaces of 15 of my 16 great-great grandparents and they were all were born in England in the following locations: Berkshire, Bristol (2), Devon, Essex, Gloucestershire, Hampshire, Hertfordshire, London (x 5), Somerset and Wiltshire. My great-great grandparent with an unknown birth location was very likely to have been born in London. - I know the birthplaces of 24 of my 32 great-great-great grandparents. I have one ggg grandmother who was born in Ireland, and one ggg grandfather who was born in Scotland. 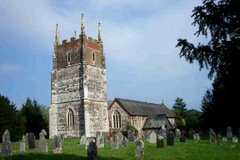 My other ggg grandparents were all born in England in the following locations: Bedfordshire, Berkshire (x2), Devon (x2), Bristol, Essex, Gloucestershire (x2), Hampshire (x2), Hertfordshire (x3), London (x5), Somerset (x2), Wiltshire. My other eight ggg grandparents are all most likely to have been born in England, probably in Bristol, London and Hampshire. I am probably fairly typical of someone with ancestry from the south and west of England whose ancestry has been filtered through the melting pot of London. Here is my Ethnicity Estimate from AncestryDNA. According to the AncestryDNA FAQs (Interpreting my results Q5) the test can "reach back hundreds, maybe even a thousand years, to tell you things that aren't in historical records". In the Ethnicity Estimate White Paper AncestryDNA caution that "Genetic estimates of ethnicity also go back thousands of years, beyond the end of a pedigree paper trail. Regions identified as “populations” in a pedigree may have been very different thousands of years ago, and so may be represented differently in a genetic ethnicity estimate." Here is the MyOrigins report from Family Tree DNA. The timeframe for the genetic clusters is not given but in the MyOrigins White Paper it is stated that the clusters "span extant modern human genetic variation" but are also "reflective of ancient migrations and admixtures". 23andMe provide the most sophisticated tools. 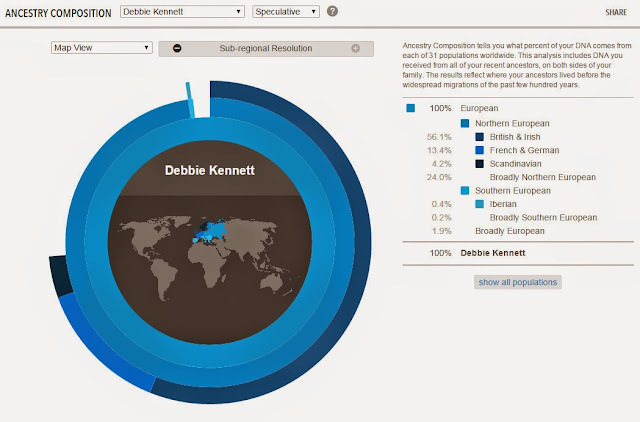 They offer three different Ancestry Composition reports - conservative, standard and speculative. They tell us that these results "reflect where your ancestors lived before the widespread migrations of the past few hundred years". As can be seen, these admixture percentages bear little resemblance to my documented pedigree, and when the companies try to break down Europe into individual countries they come out with quite variable results. It is perhaps only to be expected considering that there is a very limited range of reference populations available. The companies all supplement the publicly available datasets by using samples from their customer databases, but they still only have a very small number of samples from the British Isles. Here is a list of reference samples for Britain and Ireland for each of the three companies. 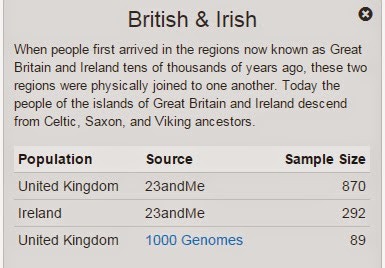 As can be seen, both Ancestry and Family Tree DNA have very small sample sizes from the British Isles. They have not made any attempt to split the samples into constituent countries. Northern Ireland would be expected to be genetically very similar to Scotland but we don't know if Ancestry's Irish samples are from the north or the south of Ireland or from both countries combined. We don't where in Great Britain their samples were taken from. Family Tree DNA seem to think that Scotland has already separated from Britain and is a country in its own right! In view of this, it is not clear if their British samples also include people of Scottish ancestry or if they now think that Britain only consists of England and Wales. It is also not known if their Irish samples are for people with ancestors from the whole of Ireland or just from the Republic of Ireland. 23andMe have the benefit of a larger dataset but this has not improved the accuracy of their reports, and they have a confusing grasp of geography. They label a cluster as "British and Irish" but describe samples collected from the UK and Ireland. Do they realise that Northern Ireland is part of the United Kingdom? One wonders if customers with ancestors from Northern Ireland described themselves as from Ireland or the UK. It would have made more sense to ask people to define which country within the British Isles their ancestors came from rather than providing two confusing and overlapping options. In view of these limitations it is therefore not surprising that we often see some bizarre results. For example, it is often the case that Americans come out with much higher percentages of "British" ancestry with these tests than "native" Brits like me. Americans sometimes have surprisingly high percentages of "British" of 80% or more. The lack of defined reference samples from specific countries within the British Isles also sometimes gives confusing results. I have one project member with seven of his eight great-grandparents born in Wales and one great-grandparent born in Devon. 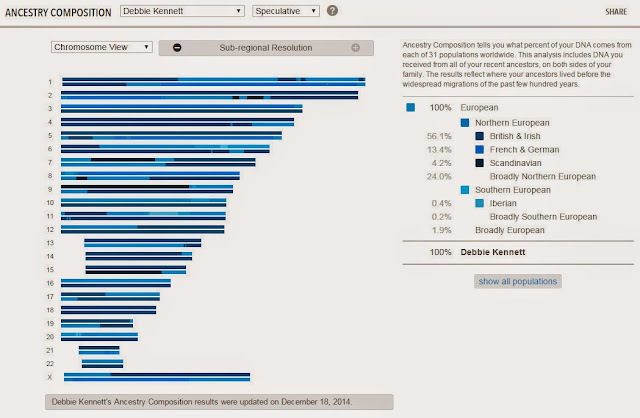 At AncestryDNA he comes out as 64% Irish and 12% Great Britain, 12% Scandinavia and 11% Trace Regions. At Family Tree DNA his ancestry is reported as being 97% from the British Isles and 3% from Finland and Siberia. There are no doubt problems with the sampling in other countries too which produces similarly misleading results. Joss ar Gall, who writes the Le Gall of Lower Britanny blog, is French and all his ancestry is from Britanny yet, according to his 23andMe test, he is only 19% French. AncestryDNA assigned him with no French DNA at all but found that he was 46% British and 10% Irish. One would expect many similarities between the French and the English but clusters which clearly cross country borders should not be labelled so specifically because people are misled and take the labels too literally. Admixture tests really need to be used for entertainment purposes only at the present time, and the results should be taken with a very large pinch of salt. However, the tests can sometimes provide useful insights. Generally it is possible to distinguish between populations at the continental level (eg Asian, African and European) provided you're from a population that is not close to a continental border. Admixture from endogamous populations such as Ashkenazi Jews and Finns can also be detected with reasonable confidence. However, it is not possible to distinguish between populations within individual European countries and it may never be possible to do so because our ancestry is so complicated. While admixture results at the individual level are not particularly meaningful there is much more insight to be gained when the results of these tests are compared at the population level. AncestryDNA also did a similar exercise with their American testers and produced a genetic census of America with a range of maps showing the contribution of the different admixtures to the American population. Ancestry also provide a useful bar chart which is hidden away in their help menu showing the differences between the various clusters. The chart below shows the differences between European regions. To access the chart click on the question mark in the top right of your screen from your ethnicity estimate page to open up the help and tips menu. Then click on "Why you might have more (or less) from a certain region". There is also a chart which will give you the breakdown for all 26 clusters. A group of 23andMe scientists published a fascinating paper earlier this year in the American Journal of Human Genetics on The genetic ancestry of African Americans, Latinos, and European Americans across the United States (Bryc, Durand, Macpherson et al 2015). While these admixture tests will probably never give us all the answers we want, they will no doubt improve over time as better reference samples become available. We are already on the second incarnation of these tests at all three companies and we can expect to see many more improvements in the years to come. I would hope that all three companies will eventually be able to have access to the dataset from the People of the British Isles Project which should give improved estimates for people of British ancestry. It would also help if the reference samples were collected more carefully and with precise countries of origin clearly defined. This article was updated on 17th May 2015 to include the screenshot of the bar chart from AncestryDNA showing the admixture breakdown within Europe. The article was updated on 18th May to include a mention of AncestryDNA's genetic census of America. The article was updated on 1st January 2017 to include a link to an AncestryDNA blog post on the percentages of Scandinavia DNA found in British and Irish testers. What is ancestry? by Joe Pickrell. DNA.Land blog, 1 November 2015. Ancestry Composition: a novel efficient pipeline for ancestry deconvolution by Eric Y Durand, Chuong B Do, Joanna L Mountain and J Michael Macpherson. A paper deposited in the preprint server Haldane's Sieve on 20 October 2014. How AncestryDNA determines ethnicity. Ancestry Advice Centre, Answer ID 5449, updated 14 April 2015. In it I analyzed the admixture results of my wife who is about 5/8 of German/Prussian descent. I don't believe her results were that different than your Debbie. I think I'll go back and compare your results with hers. The results could be interesting. That's an interesting comparison. I think the DNA that the companies are calling "British" or "British and Irish" is actually more widespread and includes France and Germany. These national labels are highly misleading. You gave me a lot of reading to do, Debbie! My own ancestry is English/Welsh/Ulster Scots/Irish. I always record my grandparents as being from Ireland, because they were - there was no Northern Ireland when they emigrated to the US. One reason for my surname/DNA study was to see if we could determine the origins of my mother's maiden name, McElrea - Scotland or Ireland, we thought. So far, the earliest records found and the best match we have is with the Mylrea name on the Isle of Man. Who knows how many times they went back and forth? The admixture results for my siblings and me are varied, of course. As you say - nice entertainment, but I won't spend much time on it for now - just give me cousins so I can track the different families on paper! Thanks Kathleen. The changing country boundaries do cause problems. I think it would be best if companies were to ask for the actual place of birth (ie town or village) for each grandparent as they did for the People of the British Isles Project. We would expect to see big differences between present-day Northern Ireland and the Republic of Ireland. I shall be very interested to see the published results from the Irish DNA Atlas Project. This is pure hokem, misguided drivel for your readers and reckless for you to ever think your 'hope' about any PoBI data will ever happen. Any data includes individual data or anonymized cluster level data at the Autosomal DNA SNP level. It ain't happening. You said: "I would HOPE that all three companies will eventually be able to have ACCESS to the dataset from the People of the British Isles Project which should give improved estimates for people of British ancestry." These 3 companies are not recognized academic institutions as Wellcome Trust requires for access to such data. Wellcome Trust does not want to deal with Genetic Genealogists nor the companies that service tem. Wellcome Trust is into 'Health Genetics' research and not into personal or group based'Genetic Genealogy' in anyway shape or form. In addition, the 2006-2009 SNP based method did not test many of the recently discovered YDNA SNPs such as R1b-L371. I was told that by a leading academic in this area. The same goes for finer detail on MtDNA. Plus, you will never see any surnames to equate with any of the 2,039 UK persons tested. Before you reply, I suggest you contact Wellcome Trust. I was wondering if you have tested with DNA-Tribes ? Here is a question I asked DNA-Tribes, with their reply. "First of , I am very happy with the results I have gotten from your test, for autosomal DNA, 27 markers. But I wanted to ask you if you can point me to a comparison of your autosomal test and the ones from Family Tree-DNA and Ancestry-DNA ? The reason I am asking is that some of the folks who run Facebook pages on ancestry research claim that your company uses outdated technology, or that 27 markers is not enough to get accurate results. They are claiming that these other two companies test more markers ? > One person told me that in all the forums on DNA and Genealogical research, that Tribes is disparaged, as not good. But in my case, the results I have from FT-DNA and Ancestry DNA, are very basic, with most orientation towards Nordic and English DNA. Both tests miss a lot of populations, in my opinion. > So, like I said, if I could see some comparison info, especially on how many markers are tested , this woudl be great ! > So, can you point me to any side by side compression information, as I wish to defend the results I have from Tribes, as I believe them to be accurate." I think it is difficult to compare the products, because the testing you are referring to are SNP tests and not STR tests. STR markers are not binary, so each carry more information than a SNP. That said, a 27 marker STR test yields 54 dimensions along which to assess a customer's ancestry and SNP tests are based on 10,000s if not 100,000s of dimensions (SNPs). As such, the latter do offer a greater power of exclusion/more specificity, but SNP reference datasets are much more sparse than STR data - hence, STR-based tests have better coverage when it comes to the diversity of populations. Also, other companies and their tests tend to over-emphasize European ancestry (by design) and DNA Tribes always reports results as they are - rather than trying to skew the results towards more European ancestry. Thank you for contacting DNA Tribes"
I haven't tested with DNA Tribes. I had wondered about doing so but it's rather expensive for what it is and I'm not a big fan of admixture tests at the best of times. They are right that are more reference datasets available for autosomal STRs than for SNPs. STRs are used for forensic purposes. Well you know my opinion of all this Debbie - these populations are so intermingled as to be almost identical and it's a gimmick. Or you could just face it, you are not really British like I am. But seriously, one thing I've found you can do is flick through the huge list of matches for foreign surnames and use the chromosome thingy to see what parts of what chromosome are giving you the foreign readings, This also helps to distinguish what side of the family is descended from aliens. 27 or less SNP markers to infer populations has always been largely rubbish. Unfortunately there are hundreds of older published refereed papers that do exactly that. Joe, I agree with you to a certain extent. However, I do think the results will improve over time and become more meaningful. The current tests are using 700,000 SNPs which is a big improvement on 27 STRs. Nevertheless autosomal DNA testing is still very useful for genealogical purposes for close relationships. The phrase "British and Irish" is not uncommon. National boundaries have changed over the centuries, but "British and Irish" is a geographical (not political) designation referring the island of Britain and the island of Ireland. However, it's more problematic to use the term "British" or "Irish" to describe the people who have lived on those islands because of the changes in national boundaries. I think researchers need to be more careful to specify what they mean when they ask the questions. I was very confused by my results as I was expecting that 51% to be Great Britain rather than Europe West. Could you please explain why I only have 5% Great Britain? Jacob, You should not expect your admixture results to match your genealogy for all the reasons I've explained in my blog post. As you can see from my own results, even as a "native" Brit" I still only come out at 21% Great Britain at AncestryDNA. All the companies are working on new versions of their admixture tools so we can hope that there will be some improvements. 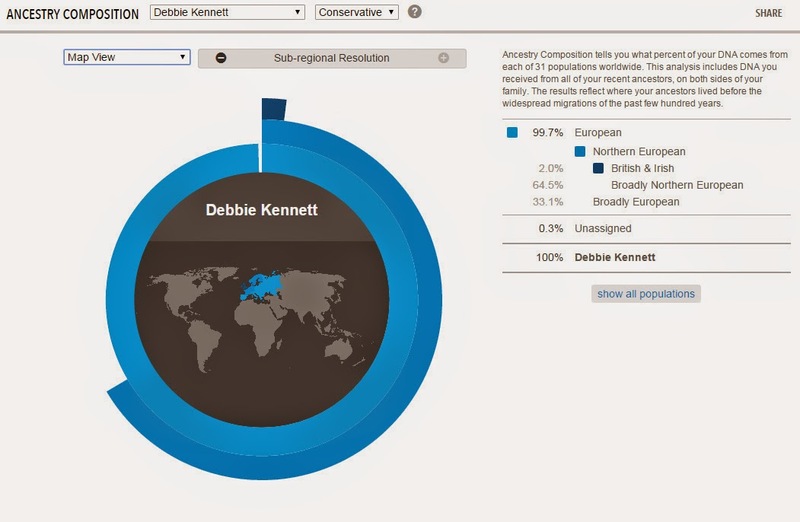 Very interesting I am also a native Brit with ancestry from as far north as Yorkshire and as far west as Pembrokeshire (west wales) with a lot of ancestry in Victorian London and around Bristol too. Iv only done the 23 and me test and I thought it was amazing :) all my results were pretty standardI scored 72.4 percent British and Irish 3.1 percent Scandinavian and 3.9 percent French and German the rest was I think 20.3 percent generally north Western European oh and 0.3 percent Finnish which was the only thing a little unexpected . 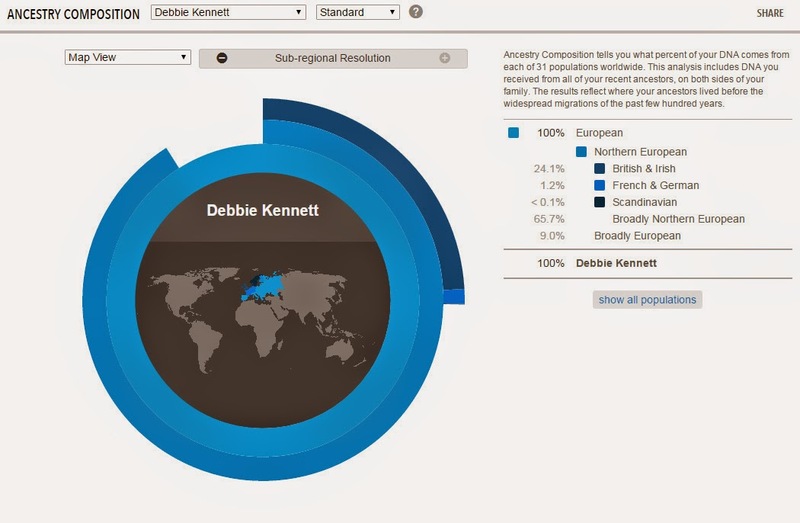 Debbie what was your maternal haplogroup on 23and me? Mine was j1c2 the same as Richard the thirds and my paternal haplogroup was r1b1b2a1a1d which is anglo-Saxon in origin I have since discovered more likely too be Saxon as my last name is winstone and originated in Gloucestershire . The 23andMe test is indeed very interesting though you shouldn't take the "ethnicity" results too seriously. They do not correspond with your genealogy. My mtDNA haplogroup is U4c1a. There are all sorts of additional tests you can order to refine the subclade. They also have a summer sale on at the moment! 23andMe are using very old haplogroup names. You would need to check the ISOGG Y-SNP tree to get the most up-to-date name. These tests can't currently distinguish between populations at the country level. The "Irish" percentages at Ancestry are way too high and are synonymous with British and other North-Western European ancestry. I suspect they don't have enough reference samples from Italy and the Southern Mediterranean so you're matched with the next closest populations. We can expect to see improvements in these tests in the future as more reference populations become available. Thank you Debbie. I expected 37 % Irish and 13% british as my mum is Irish with some Scots Irish, I even got 4%scandinavian and 1 % east europe and possibly balkan balto slav and I don't know if that's south /south scandinavian Baltic Slav admix and quite possibly from my father's side (vandals and Lombards ) rather my Scottish Scots Irish grandfather possible viking). When tried eurogenes on gedmatch I was coming out note Mediterranean , middle east and Ashkenazi on (J test) so I'm considering getting family finder DNA test as well. 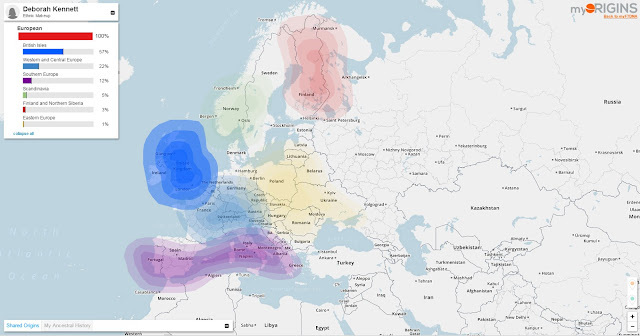 Iberian high too ( suspected Spanish Jewish great great grandmother) but ancestry not really picking it up plus I spilled most of blue solution when idid my test. Ancestry got me as 65 % british and Irish which is way off! Wondered if you got my last message about gedmatch etc? I did receive your messages. I have to use moderation on old blog posts because of problems with spammers and trolls so there is sometimes a delay before comments get published. The Family Finder is worth doing as it will give you a different selection of matches and additional tools such as a chromosome browser. FTDNA have lots of Jewish people in their database so if you have any Jewish ancestry you would expect to see matches with lots of people with Jewish surnames. However, I would have thought this would have shown up in the AncestryDNA test. We don't have good data on how the Eurogenes percentages compare with genealogical trees and I don't know if the results you received have any significance. I don't know what reference populations they are using for Italy and we will have to wait and see when they publish their White Paper. Thanks very much. I do have quite a few Jewish matches not on pop results on Ancestry but it may just be because all Italians seem to have high Jewish results. My father is from alpine Italy and has relatives from Switzerland and Spain and he has quite possibly a Jewish great grandmother via Spain as my family ran hotels in Spain (quite plausible) Gedmatch cam up with 5%ashkenazi and 5/6 west Asian but again it may be Iberian Italy Greece which converges on that Jewish link. My ist cousin removed neither confirms nor backs my claims up. I know my great grandfather(his grandfather was called Guido and his sisters Maria Pia and Maria Pilar. The photos i have of them in all honesty they look very southern Italian or Jewish. I know their ref populations are Americans and are mainly southern Italians on ancestry plus even if they took Scottish samples from Scotland they are likely to have ancient DNA and even recent ones from Italy as Scotland does have Italian immigrants in the last 130 years_. Have dual nationality so not amongst thatvadmixed population. Thanks for the links! Will think about doing another test! It does sound to me as though you do have some Jewish ancestry, especially if you're also getting some Jewish matches. FTDNA have the largest Jewish database so I would suggest you test there as well. thx for sharing this deb. God bless you. what is FTDNA ? i would like to see if i have Jewish roots . theres another dna testing called Jewish voice ministries i think . thx in advance for any help and why are they the best for Jewish roots? 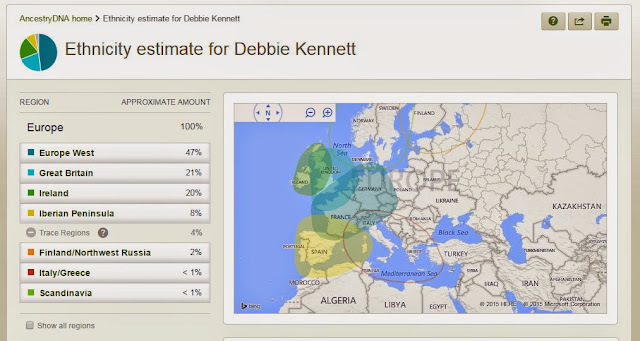 However, it would also be worth testing at AncestryDNA as they now have the largest database. 23andMe is interesting if you want the health reports. Hi, this is a much more generalised comment, with no referral to DNA and its sub sets, but I hope my information/questions/explanations are of interest. I am in central Scotland, I'm 61 years old (female), and have lived north of the border for 47 ish of my 61 years. I do sound southern English, as I lived in the south west from 1 - 14 years of age - but that is another story. I am in short a Scot of nearly 100% Irish origin, as far as I can tell, with my antecedents coming to Scotland early eg:- 1826 (greatx3 grandfather married in Falkirk - Daniel Duffy) and the latest arriving in Scotland in and around 1870. The latest was my father's maternal grand mother Margaret Burke, who came from Clifton, County Galway, and married in Glasgow in 1874, but can't be found on the 1871 census. There are only 2 minor twigs of my tree whose origin I don't have evidence as being from Ireland, that is the above mentioned Daniel Duffy's wife, Rosanna Moreland, who could have been either Irish or Scottish, and who died before civil records began, and one branch from Southend, at the tip of the Mull of Kintyre, Where Irish Frank Darroch married Scottish Catherine McNaughton. Catherine is estimated to be born about 1791, and I have her parents names,from her Scottish death certificate from 1861. My point is, that my evidence suggests nearly 100 % irish ancestry, though all but one, the aforementioned Margaret Burke, are definitely of ulster origin, or, if unknown, irish origin, are very likely to have been from Ulster, as they emigrated to Scotland, rather than further south . My point is to speculate what my ancestry results would show ?? I suspect rather than being 100% Irish, it would be likely to be nearer 100 % British, with my ulster Irish ancestors ( not Ulster Scots, as my ancestors were from the catholic peasant classes, rather than from plantation stock), being indistinguishable from the northern Brits of western Scotland and north western England with whom they would have long term intermingled. I suspect that only Margaret Burke's input into my genealogy would be western Irish, and even that might mot be so, as the Burke's are reputed to be descended from Spanish sailors, who 's ships were wrecked on the bleak west Ireland coasts after the failed armada invasion, but that, again, is another story! Thanks for your interesting comment. It's very difficult to speculate. People with ancestry from Ireland do tend to come out with quite high percentages of "Irish". 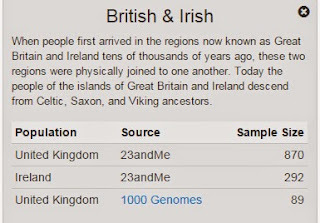 AncestryDNA have recently changed the labels of their clusters and they now call the Irish component "Irish/Scottish/Welsh". However, with ancestry from Ulster then you're like to have an English component as well. AncestryDNA have a nice new genetic communities feature which is able to assign people to regions within Ireland and Scotland. 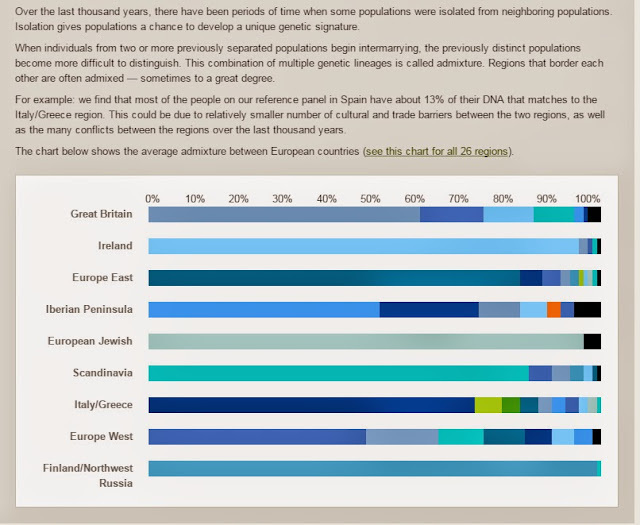 These communities are much more reliable than the "ethnicity" estimates which reflect your ancestry from 1000 or more years ago. All the companies have sales on at the moment for Black Friday so if you wanted to find out it's a good opportunity to test. The prices are now very low. George, AncestryDNA have now updated their reports and I expect you'll find that the Iberian has disappeared.